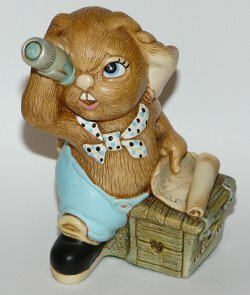 Retired PenDelfin rabbit Jim Lad designed by Doreen Noel Roberts. 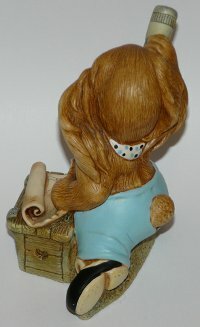 The Jim Lad figurine was produced by the pottery from 1986 until 1992. This is the first version with no thumb under his telescope - they later added his thumb under to support the telescope which was often broken in production. He is wearing blue trousers and matching neck scarf. On his base this PenDelfin figurine has his original green felt and PenDelfin artist palette Jim Lad pottery label. Condition: Superb overall condition. A lovely PenDelfin figurine.